Inter-religious doctors and participants come together to bring medical services to the disadvantaged. Friends of Good Health is a local grassroots effort to bring modern medical advances to the disadvantaged. Just at it's beginning, PTWF has partnered with this worthwhile cause and is sponsoring a trip of over 20 doctors, along with vital medical supplies and medical equipment, to the needy in South America to make a difference. This project was the inspiration of Mr. Bobby Kalotee, a local Long Island businessman and philanthropist. Friends of Good Health brings together representatives of many faiths and beliefs, in order to provide needed medical expertise to those who would never have such access. PTWF is proud to sponsor this work in service to our mission to bring about inter-religious gestures of good will, which show the caring and benevolence of all, in the service of humanity. You can make your tax deducible gift to Friends of Good Health through PTWF. 100% of the funds collected will go to the charity. Pave the Way Foundation is a registered 501C3 Public Charity. 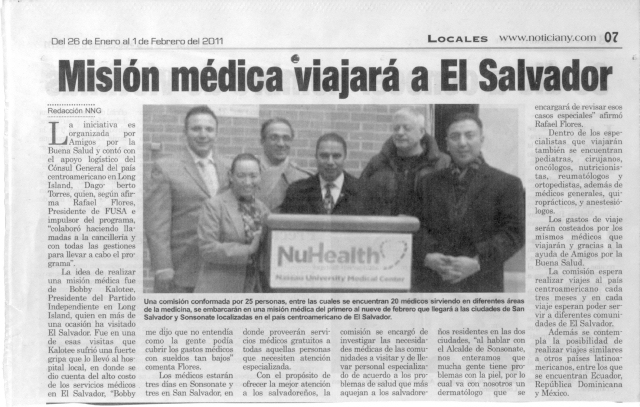 February 2011 our group of physicians went to El Salvador. Preliminary reports that over 5000 patients were examined and treated. A group of doctors from the organization "Friends for Good Health" (Friends for good health) will arrive in El Salvador on February 4 to participate in healthcare campaigns, directed atlower-income population of San Salvador and Sonsonate. 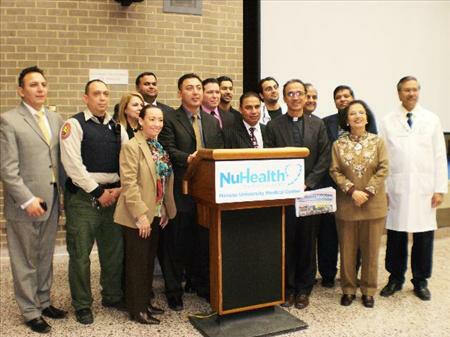 At a press conference at Nassau Medical Center of Long Island, Bobby Kalotee, president ofthe philanthropic organization said the campaign will be conducted through collaboration and coordination that are making the mayors of Sonsonate and San Salvador, Roberto Aquinoand Norman Quijano, who have secured all the necessary logistics for the campaign which will run between 4 and 9 next February and will provide free medical care in different medical specialties to physicians by 23 experts who donate their time to Friends for Good Health. The volunteer group provides services in different hospitals in Long Island and New York will be the first time they travel to El Salvador on a humanitarian mission, which this year will alsopropose extending to Ecuador and the Dominican Republic in the coming months.